Structural steelwork erection is under way on a prestigious project for the local authority in Colwyn Bay, North Wales. Conwy County Council has contracted Bowmer & Kirkland to build the new steel-framed four-storey office building and an adjacent 354-space multi-storey car park. The 9,200m² office block is aiming to achieve a BREEAM ‘Excellent’ rating and will replace up to 13 existing offices in and around Colwyn Bay. 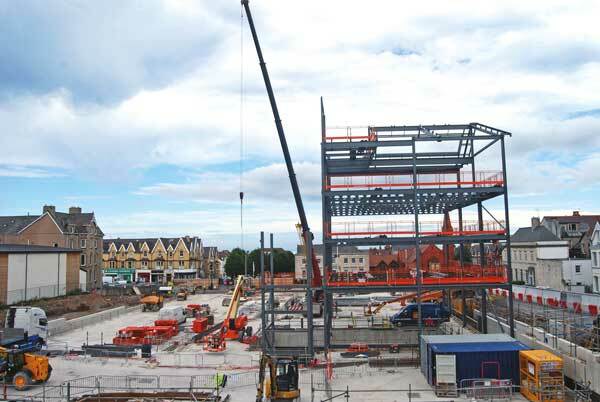 Steelwork contractor EvadX is using cellular beams throughout the scheme. For the three-level car park, the beams are supporting precast planks, while in the offices they work compositely with metal decking. Work on the project began in November 2016 with a site clearance and demolition programme of existing buildings. Completion is set for October 2018.